Romance and journalism: Indira Lakshmanan comments on a relationship between a New York Times reporter and an official of a government committee she covers, a failure of ethical journalism. “It’s not a news flash that you can have a romantic partner and you can have a source, but they can’t be the same person,” she writes. Fake News vs. facts: Indira Lakshmanan says the Washington Post deserves a Pulitzer Prize for journalism ethics. The Post’s investigative journalism “was most extraordinary for its transparency, breaking the fourth wall between the newsroom and readers by revealing those techniques to readers — showing how reporters got the story,” she writes. That reassured the public about the paper’s motives, methods and findings, and inoculated the Post against false claims, she says. 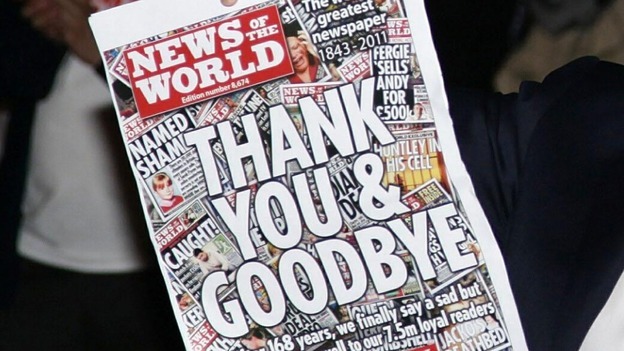 Ethics violations close Britain’s News of the World. itv.com photo. British journalists are more likely to pay sources for information than American journalists, but journalists in both countries agree that providing reliable information is their chief goal. These are among the conclusions of a survey of 700 of the United Kingdom’s almost 64,000 professional journalists, by the Reuters Institute for the Study of Journalism at the University of Oxford. “There is a close correspondence between U.K. journalists’ views on ethics and their professional codes of practice. However, they are more likely to find justification for ethically contentious practices, such as paying sources, than journalists in the United States. As for misrepresentation and subterfuge, U.K. journalists expressed mixed views about whether claiming to be somebody else is acceptable. Fifty-four percent believe it is never justified and 46 percent think it is justified on occasion. U.S. journalists, according to the study, are more disapproving, with only 7 percent agreeing that misrepresentation is justified on occasion.